The club was formed in 1924 and were originally known as QUORN METHODISTS. The name Quorn is more associated with a vegetarian meat substitute food product and as such their nickname is listed as 'The Vegetarians' on Wikipedia, though with no official confirmation, this is in all likelihood a hoax. The club are actually based in a Leicester village which has been home to English sporting heroes Gordon Banks and David Gower. The football club can count some famous players amongst their ranks - in 2003 they sold Luke Varney to Crewe Alexandra while former Premiership striker Dion Dublin also played for the club. 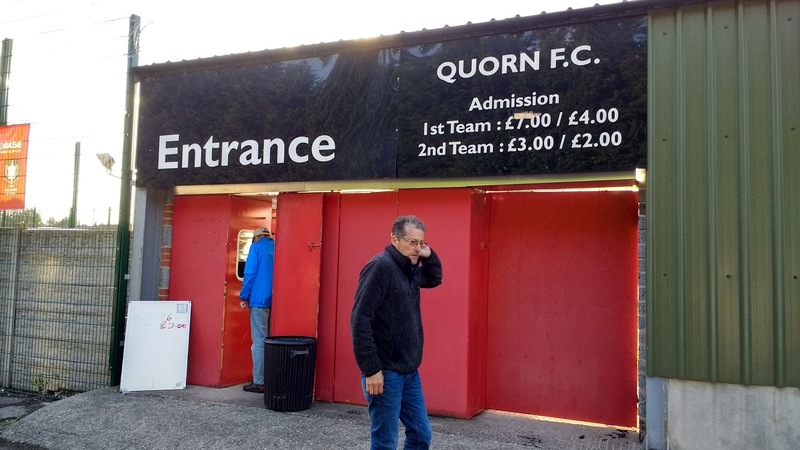 Quorn reached the 5th Round of the FA Vase in 2007 where they lost to current Conference South side Whitehawk and the 3rd Qualifying Round of the FA Trophy three years later, losing to Vauxhall Motors. Before and after their name change to Quorn in 1952, they were long time members of the Leicestershire Senior League, bouncing around its various divisions during a 64-year spell. They joined the Midland Alliance in 2001. They never finished outside the top 7 and in 2007, due to the expansion of the Northern Premier League, third place was deemed good enough for promotion to the NPL Division 1 South. This coincided with a £500,000 windfall following the sale of former striker Luke Varney to Charlton Athletic which allowed them to make the required ground improvements. A five-year spell here followed, with two 12th placed finishes being their best placing. 2012 saw relegation back to step 5 with only Shepshed Dynamo keeping them off the bottom of the table. They've been there ever since, spending the first season in the United Counties Premier where they finished 7th. The following season saw a sideways step back to the Midland Alliance, which would become the present day Midland League. After a 5th place finish in 2014, mid-table placings have been the order of the day ever since. Quorn's debut in the FA Cup came in the 2002/03 season when they won 3-2 at Histon in the Preliminary Round. 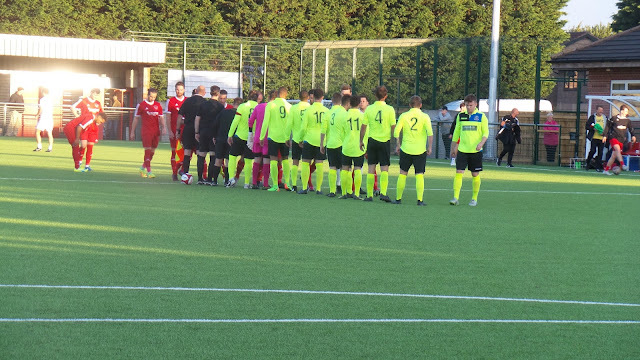 They had to travel again for the next round, losing 4-1 at King's Lynn in the 1st Qualifying Round. Record progress was achieved during the 2006/07 season. After beating Arnold Town, Malvern Town, Gresley Rovers and Belper Town, they were drawn against Brackley Town, that season's Southern League Division 1 Midlands champions. After drawing 0-0 on their own patch, they lost 2-1 in the replay in Northamptonshire. Quorn's record win in the FA Cup came in the 2006/07 season as they defeated Arnold Town 6-0 in the Extra Preliminary Round, whilst the record defeat was the 4-1 defeat to Kings Lynn in 2002. 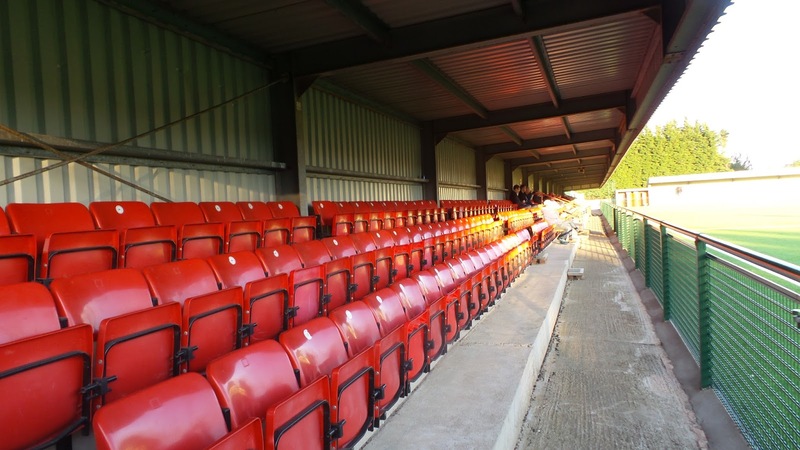 Defeat in tonight's game could see them equal their longest wait for a win - between 2003 & 2006 they suffered three consecutive defeats at the first hurdle and have not won an FA Cup game since 2014 when they beat Bottesford Town 3-1 in the Extra Preliminary Round. 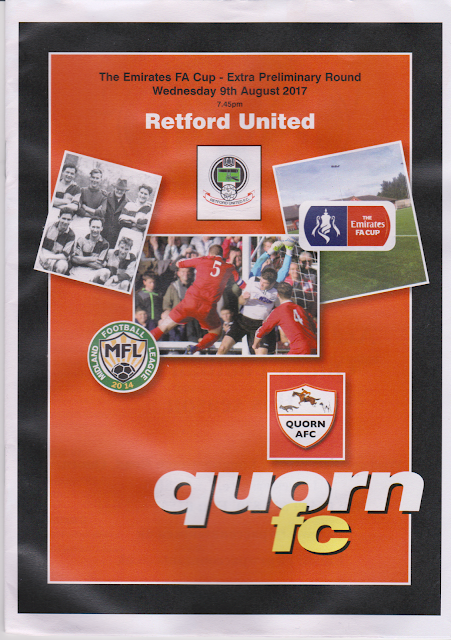 Retford United's debut in the FA Cup also came in the 2002/03 season. They beat Jarrow Roofing after a replay before losing to Burscough in the 1st Qualifying Round. Their best run came during the 2008/09 season. They beat Barrow Town, Willenhall Town, Romulus & Newcastle Benfield before a 3-1 defeat to Alfreton Town in the 4th Qualifying Round. Their opponents, playing in the Conference North at the time would go on to reach the 2nd Round before losing to Scunthorpe United. Retford's record win came in a 2006 Extra Preliminary Round tie as they beat Tadcaster Albion 6-0. Their record defeat was a 5-0 loss to Mickleover Sports in a 2010 1st Qualifying Round tie. 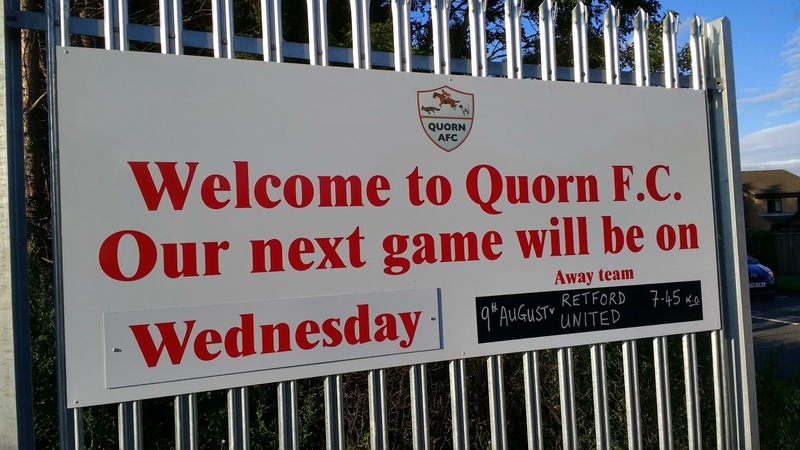 Like Quorn, they've not won an FA Cup game since 2014 and defeat tonight would mean that they would have suffered 3 consecutive defeats at the first hurdle for the first time ever. Though I'd been trying to cut down on midweek football due to putting too many miles on my car and feeling tired the next morning, I was always going to make an exception for FA Cup games. There didn't seem to be much on for my usual Wednesday night hopper Chris and I in terms of replays, so I was pleased to see that Quorn had changed their midweek matchday to that particular night. With me staying local for Wycombe v Fulham on Tuesday, the distance and late night would not be so much of an issue. 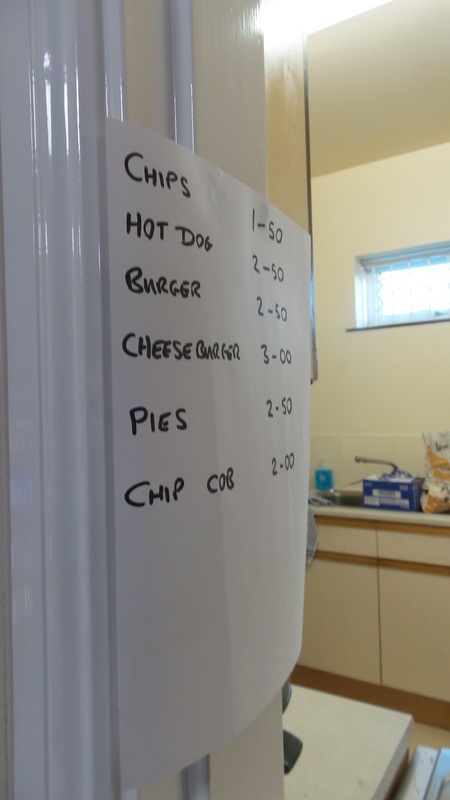 I noticed that the Quorn manager was former Kettering player Dougie Keast. He was part of the side that ensured I would have to wait until my second season to see my first FA Cup game as he was part of the Kettering Town side that defeated Wycombe Wanderers 2-0 in an FA Cup 1st Round replay, which I was unable to go to because of school. It wouldn't take me long to fall in love with the competition though - the following season saw us defeat Merthyr Tydfil before a 2nd Round epic against West Bromwich Albion with us going out of the competition after a replay. That wasn't before a brilliant 2-2 draw at Adams Park in front of Sky TV cameras and a brilliant atmosphere which I attended in person. The assistant manager is even more famous - former football league player Russell Hoult, most well-known for a spell at Derby County. The previous night I had been to Wycombe v Fulham, ironically my team v Chris's team. We'd been a bit under pressure in the first half but defended and got to the break still level. Despite being much improved, we lost the second half 2-0 to seal our 8th first round exit in 9 seasons. I got home just after 10 and was in bed by 10.30. Annoyingly, I had a restless nights sleep but felt fine the following morning when I got up at 4 for work. Luckily, it was a fairly easy day at work and I was home just after 11 to catch up on some much-needed sleep. It wasn't the greatest kip I'd had, but at least I'd got some in. I had a freshen up, got my things together and left just after 4. I met Chris around 5.10 and soon we were on our way. I'd planned our pre-match dinner stop and thanks to good roads, we were at the Golden Orient Chinese take away by 6.10. I was starving, not having had anything since breakfast. 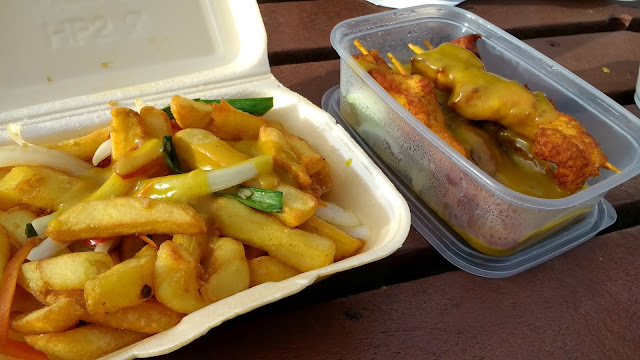 The salt and chilli chips plus curried chicken skewers went down very well. Due to lack of tables, we drove on to Leicester North services. It was well above average and one of the better places we have been to. We drove on to Quorn, arriving at 7. After paying £6 for entry and £1 for a programme, we were greeted by the friendly team manager, Dougie Keast who took the time to chat about playing for Kettering after spotting the badge on my jacket. He recalled playing at our old ground, Loakes Park the massive sloping pitch. Our tactics were to boot it up the field which proved highly lucrative due to the slope. To be honest, the tactics have changed little in the modern day team, just with a little less finesse. We went into the bar which was very smart. There was nothing special on, drinks wise, so I just settled for a Bovril while Chris had a cup of tea. We discussed our upcoming plans, including a possible double in the north east on bank holiday Monday. We chose to sit in the nicely sized stand for the first half, sitting around the halfway line. Despite being the visitors and being from a lower league, Retford United were well on top during the early exchanges. After not seeing much of the ball for the first 25 minutes, Quorn started to have a good spell. They opened the scoring when Nathan Dale's low curling shot from the edge of the area opened the scoring on 33 minutes. There was a couple of minutes pause towards the end of the first half as so many balls had been kicked out of the stadium, none were left and the one grey one that they did have was deemed unacceptable by the referee. Half time came and I had a brief word with Leicester based hopper Ken aka Lesta Blew Hopper who had come to watch one of his local sides. I also went to the bar to get some chips as I was feeling peckish and these were very good. The hosts extended their lead on the hour when a good through ball found Dominic Brennan and he finished confidently past Retford 'keeper James Gamble. On 78 minutes Quorn got their third from an attack on the left-hand side, effectively killing off any chance of a comeback from the visitors. The left foot finish from Armavir Sandhu meant that the rest of the game was played out at a reduced pace as both teams seemed to know where the tie was heading. The game played out with little further incident and it was a tad annoying at the amount of added time that the referee played, with us not getting out until after 9.40. It had been a reasonable contest, though just as with Bemerton Heath Harlequins a week earlier, the visiting team would regret not taking advantage of a good early spell as they were well beaten in the end, Despite a quick getaway, there was around 20 minutes delay on the way home thanks to a a couple of junctions being closed on the M1. At least I had the Two Mikes podcast to keep me company. I dropped Chris off at 11, getting home myself at 11.55. I relaxed for 20 minutes before going to sleep. Again it wasn't the greatest nights sleep before I got up for work at 4, but I was able to catch up the following afternoon. I first visited SUTTON PARK back in the late 2000's whilst on the way to a Wycombe away game, possibly at Notts County. Back then, I wasn't a groundhopper, but still loved visiting grounds to take photos. Quorn was one of the smarter venues that I went to. There was a 350 seater stand and although that was the only cover at the time, it was still impressive for the level and well kept. 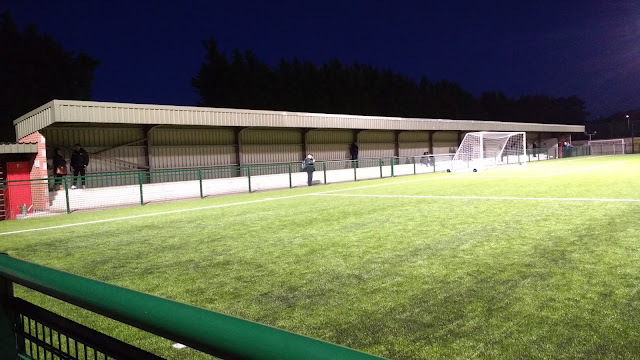 When I visited for the second time, they'd added a decent sized terrace behind one goal, which must boost the covered capacity to over a thousand. There was a decent tea bar at the ground, with the chips that I had being pretty decent. 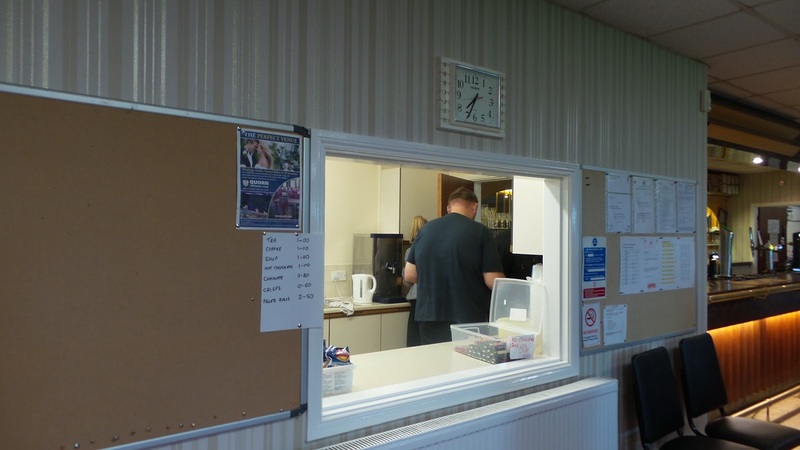 There was also a bar, this did the usual range that you would expect from a clubhouse, with Thatchers Gold for cider drinkers. 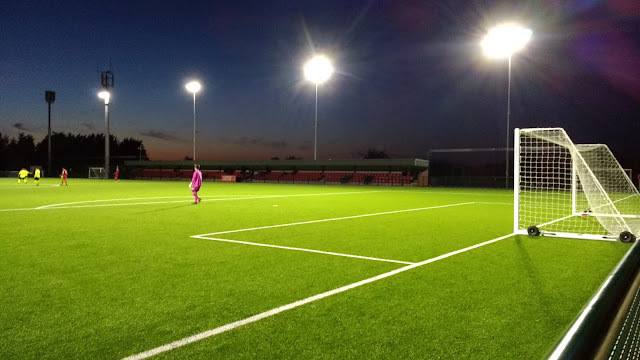 Further afield, the town/ village centre was around 10 minutes walk away, this offers a good range of outlets, but my research pointed to nothing stand out, so you are better off using the club facilities.